Writing is traditionally used for two purposes — to quickly communicate with other people and also to help the author meditate on his inner thoughts and emotions. Thus writing — particularly slow writing by hand — is a way to help people slow down and think. Technology changes the way we write and therefore changes the way that we communicate with others and also the ways that we think. Cell phones allow only short SMS messages and computer keyboards allow us to type as fast as we can think. 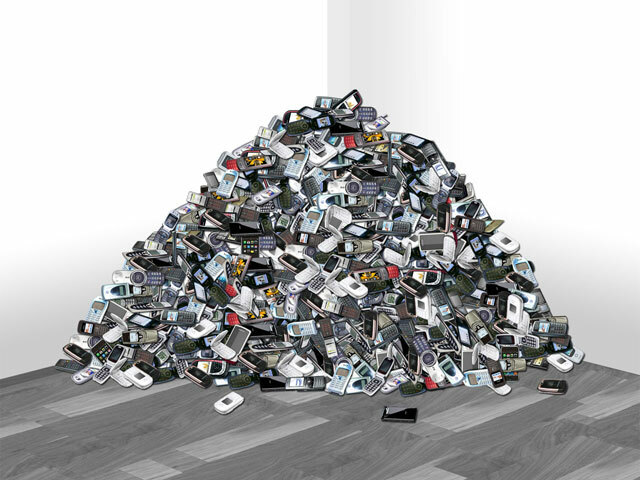 In this installation hundreds mobile phones are gathered in a gallery space and reanimated with new conversations. 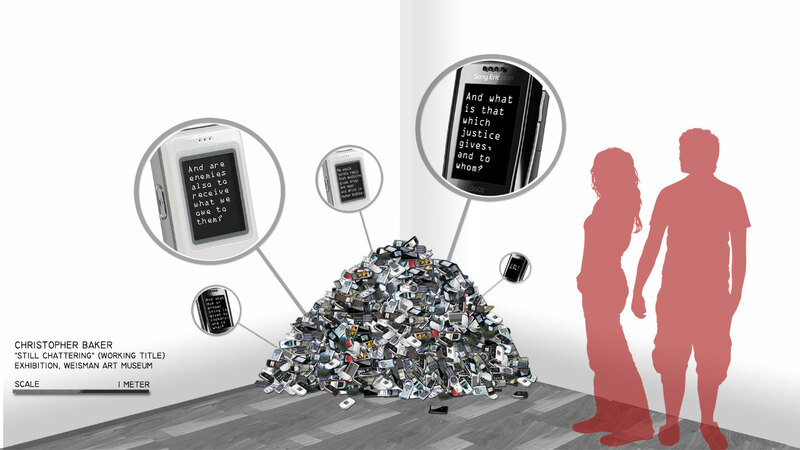 This installation examines the ways that new communication technologies — particularly cell phones have changed the way we communicate with others through writing. Using researched timing statistics from normal SMS use, virtual, imagined messages are sent from phone to phone. With each new SMS message, micro controllers cause the phones spring to life with vibrating cell-phone motors and lights. The phones reflect the mobile communication dance as they scoot along on the floor, creating a simulated social network, of clustering, movement, and at times, frenetic communication. While mostly quiet, these moments are designed to draw the audience in to engage the emerging imagined conversation and think about their own patterns of use. 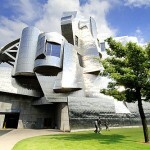 This artwork will be exhibited at the Weisman Art Museum (below), in Minneapolis, MN, USA. 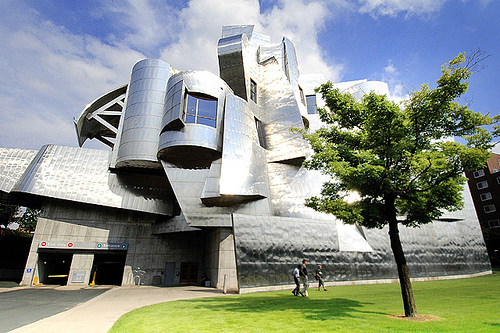 The Weisman, designed by Frank Gehry, is an iconic building overlooking the Mississippi river in Minneapolis. 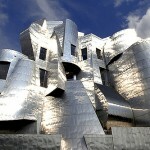 The exhibition will run from 07.05.09 – 08.05.09. 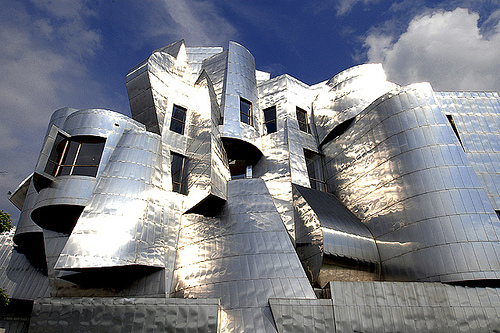 After showing in Minneapolis, the exhibit will return to Budapest for a show sponsored by Kitchen Budapest in September, 2009. 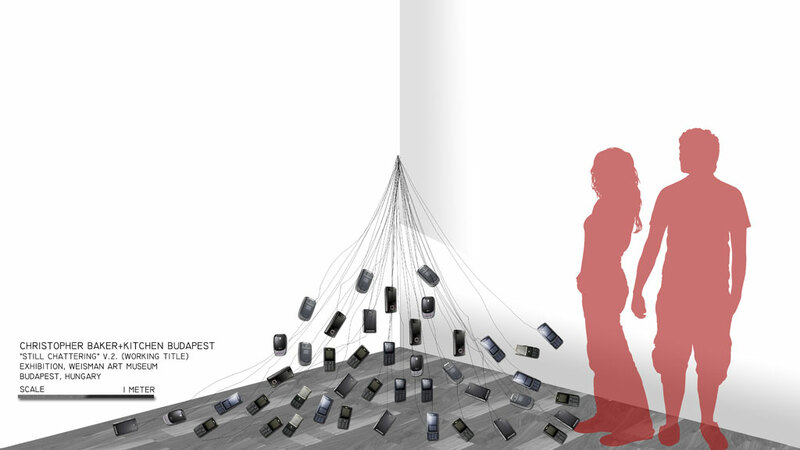 The proposed installation is a continuation of my recent explorations of our online identities and networked selves. In My Map (A Self-Portrait) , I began to contemplate the way that I imagine and represent myself vis-Ã -vis the tangle of relationships represented in my own decade-old email archive. In Hello World! or: How I Learned to Stop Listening and Love the Noise , I created an immersive experience that questioned the nature of technologically-mediated participation itself. 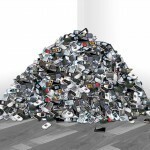 The installation consisted of thousands of “first-time” YouTube video diaries played simultaneously, revealing the intense human desire to speak and be heard. In It’s Been a While Since I Last Wrote , I was captivated by the continuous flow of blog entries that begin with variations on the phrase “It’s been a while since I last wrote”. This sentiment immediately resonated with the self-imposed sense of obligation to audience that is often seen driving participation in these online forms. 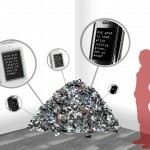 Murmur Study , a work-in-progress, examines the sheer volume of messages suggesting the impossibility of keeping up with or physically archiving the unending flow of often-banal messages. On one hand, new media technologies like YouTube have enabled new speakers at an alarming rate. On the other hand, no new technologies have emerged that allow us to listen to all of these new public speakers. Each video consists of a single lone individual speaking candidly to a (potentially massive) imagined audience from a private space such as a bedroom, kitchen, or dorm room. The multi-channel sound composition glides between individuals and the group, allowing viewers to listen in on unique speakers or become immersed in the cacophony. Participants are encouraged to dwell in the space. Murmur Study is a work-in-progress that examines the rise of micro-messaging technologies such as Twitter and Facebook Status Updates. One might describe these messages as a kind of digital small talk. But unlike water-cooler conversations, these fleeting thoughts are accumulated, archived and indexed digitally by corporations. While the future of these archives are still to be seen, the sheer volume of publicly accessible personal expression should give us pause. One might argue that the primary goal of writing is to communicate with others. But writing, particularly writing by hand, can also serve as a meditative act — a practice that fosters slow, thoughtful contemplation. While it borders on nostalgia to think that these two functions were in perfect balance once-upon-a-time, it seems clear that the rise of digitally mediated communication has altered the nature of writing. In this fast-paced, keyboard-dominated, Internet communication culture, speed is of the essence. A quick web search reveals that each day hundreds of hastily written blog entries begin with variations on the phrase “it’s been a while since I last wrote.” Invariably the authors then proceed to describe their busy lives and commit to publishing updates more frequently. Messages like these reveal not only a sense of obligation to communicate with a real (or imagined) online audience, but also point to the desire to slow down and take time to thoughtfully contemplate, record and make meaning from one’s daily experiences. It’s Been A While Since I Last Wrote is a meditation on the often-competing desires for slow contemplative writing and fast-paced communicative writing. The installation, which is comprised of a 40″ x 40″ luminescent surface and an ultra-violet writing head controlled by two motors, continuously scrawls the phrase “It’s been a while since I last wrote” in a digitized version of the artist’s cursive. Disappearing almost as quickly as it is written, the phrase encapsulates the competing desires for speed and thoughtfulness.